Holyrood Secondary is drawing on the power of graphic novels to help pupil's skills. A Glasgow school is drawing on the power of graphic novels to help raise literacy levels amongst immigrant pupils. 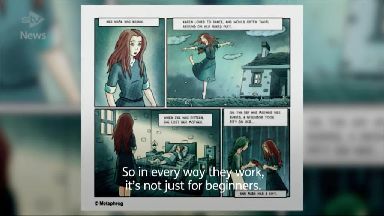 Holyrood Secondary in Glasgow is piloting the scheme where local graphic novel writers help migrant pupils improve their communication skills. The idea was first mooted after staff noticed that the school needed to try and engage its increasing number of Roma pupils. Ian Lebeter, Glasgow Life, said: "Holyrood Secondary has got a really large Roma community who live in Govanhill area. "The school librarian noticed a real need to work with those pupils and she found that arts, crafts and creative things seemed to engage them the most. " Using Scottish Government library improvement funds, the project has recruited a pair of award-winning graphic novel and comic book writers known as Metaphrog to teach students. John Chalmers from Metaphrog told STV News: " Many people recognise them as something which transcends language. They're a great way to learn a language. "So in every way they work - it's not just for beginners. They're an art form, they're very dynamic and exciting." John's views were echoed by his colleague Sandra Marrs who said: "The pupils have been amazing, really excited about the project. As soon as they realised they could tell a story they really cared about that really got them fired up." The pupils work will be published in the Spring but Sandra also revealed that the children are not the only ones in the classroom who are enjoying themselves. She said: "Making comics, you're basically sat behind a desk drawing and writing for eight or ten hours a day. "So coming here and interacting with the pupils is great fun. It's great for them and it's great for us."